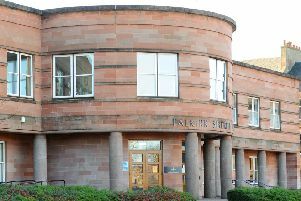 Jospeh Lang (22) admitted stealing a three-week-old baby from a house in the Falkirk area. Lang, whose address was not listed on court charges, committed the offence on October 20, 2017. The case was adjourned for six weeks until March 8 and Lang’s community payback order was allowed to run on so he can continue to engage with it. Sheriff Caldwell said he had to complete at least 40 hours unpaid work in that time or he would face the prospect of prison.